ASUNCION, Paraguay — On the last day of his pilgrimage to his native Latin America, Pope Francis practiced what he preaches, and visited a slum. Hours before he was due to fly back to Rome, wrapping up an week-long visit that also took him to Ecuador and Bolivia, the Pope went to Banado Norte, a flooding-prone slum in the outskirts of Paraguay’s capital Asuncion, where about 1500 families live in extreme poverty. “I have looked forward to being with you today. I could not come to Paraguay without spending some time with you, here on your land,” the pope told locals, after he listened to their personal stories. The pope has spent much of his visit to the continent criticizing the socially exclusive effects of capitalism, which he called the “dung of the devil," and has shown his closeness to those at the margin of society. Francis, who is also known as “slum pope” for his care of the poor, is used to visit the areas of extreme poverty to offer his support. While he was archbishop of Buenos Aires, he often visited the city’s slums, home to many Paraguayan immigrants. After being elected Pope in 2013, he didn't change his habit. During a visit to Brazil a few months later, he paid a visit one of the city’s most violent slums, Varghina. Later this morning, the Pope held a mass in front of hundreds of thousands of people, including many Argentinians who crossed the border into Paraguay to greet their native Pope, in a park turned into a mud field from the recent rainfalls. Pilgrims wore rain boots, tides plastic bag around their shoes, or wore barefoot to brave the mud and the water pools. "Welcome the hungry, the thirsty, the stranger, the naked, the sick, the prisoner, the leper and the disabled," the Pope said in his homily, again speaking out for those at the margin of society. A message that bore even more significance in Paraguay, one of the poorest nations in Latin America, where 24 percent of the population lives under the poverty line. 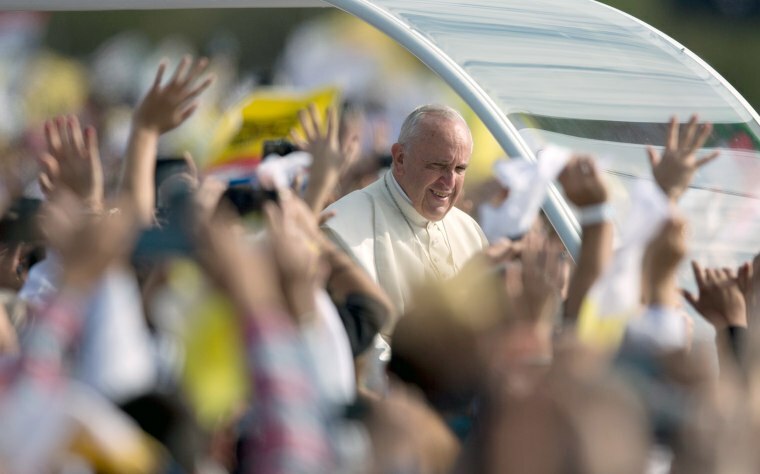 Before leaving for Rome, the Pope will meet with tens of thousands of young people who have turned Asuncion’s waterfront into a Catholic festival with chants, dances and human towers.